Now is the time to speak up, even if our words can be found wanting in the face of complex realities and the merciless world of politics. 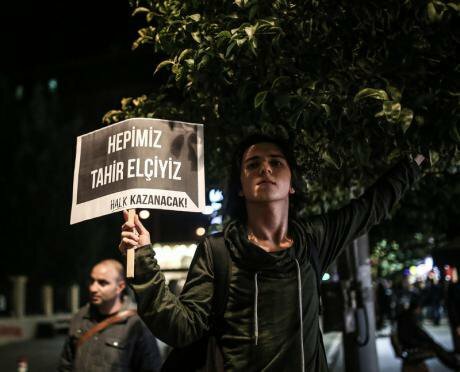 Street protest after leading lawyer Tahir Elci was killed in an armed attack, November 28, 2015. Demotix/ Erhan Demirtas. Some rights reserved. If George Orwell were to write “Politics and the English Language” in 2016 instead of 1946, he would have probably included a passage from my last openDemocracy piece on the Ankara bombings as an example of “bad writing”, for it was crammed with metaphors, “pretentious diction”, and perhaps a few “verbal false limbs” and “meaningless words”. Yet he would not have accused me of “insincerity”, which he identified as the main enemy of clear language, as there was no gap between my real and declared intent, and I had said what I wanted to say. In fact, this was perhaps the main reason why the article struck a chord and was widely circulated, stating in no uncertain terms what most observers of Turkey have known for a long time. That Turkish society has been divided beyond repair, that the Turkish Republic as we know it has come to an end. A death like no others? Barely a few weeks after the publication of this “non-prophetic” prophesy, we are watching the apocalypse unfold, our hands (in most cases, our tongues too – literally if you are a dissident in Turkey) tied, with an acute sense of despair, knowing that all most of us can do is just to obsessively refresh our Twitter feeds and retweet the “hashtag of the day”… As I do now, to follow the news of Tahir Elci’s (and two police officers’) brutal assassination during a press conference in Diyarbakir. So perhaps now is the time to follow Orwell’s advice and let “the meaning choose the word, and not the other way around”, cutting out “all prefabricated phrases, needless repetitions, and humbug and vagueness generally”. Now is the time to speak up, even if our words can be found wanting in the face of complex realities and the merciless world of politics. The picture, for those who want to see it, is clear. A ruler who has abandoned even the faintest semblance of impartiality and respect for democracy, and set out to create a regime in his own image – a “Turkish-style” presidential system, or a thinly disguised authoritarian one-man rule which would preside over a submissive, “national and native”, society which values stability over anything else. A state which sets siege on Kurdish majority cities and villages, allegedly in response to declarations of autonomy by local politicians and militant groups, in the meantime killing civilians, sometimes by snipers who are authorized to use live ammunition to quell the protests. A party which confiscates businesses and TV channels/newspapers that belong to its critics, including those affiliated with its one time ally, the Hizmet movement of the Pennsylvania-based cleric Fethullah Gulen, and turns them over to “trustees” with close links to itself. A regime which prosecutes and arrests journalists on a daily basis for either “aiding and abetting” terrorism or for insulting President Erdogan, based on Article 299 of the Turkish Penal Code – a campaign which has reached a new peak on November 26 with the arrests of two prominent journalists, Can Dundar and Erdem Gul, on spying charges, for publishing a story on Turkish intelligence trucks carrying arms to opposition groups in Syria, thereby raising the number of journalists currently in prison to 30. A government which does not even hesitate to shoot down a Russian plane for violating its air space for, yes, 17 seconds, exposing itself to a series of retaliatory measures by one of its largest trading partners and a, perhaps somewhat emasculated, super power. A country which is ranked #149 out of 180 countries according to Reporters Without Borders’ 2015 Press Freedom Index (slipping from #98 out of 161 countries in 2005); which leads the list of content removal requests on Twitter, with 408 out of a total of 442 requests in the 1 January-30 June 2015 period, and 328 out of a total of 376 requests in the preceding 1 July-31 December 2014 period; where 105.958 websites are banned at the time of writing this essay, according to the data provided by engelliweb.com which tracks internet bans in Turkey. And yet, however flawed electoral processes are, Erdogan, the puppet master of what he and his acolytes emphatically call the “New Turkey”, is a democratically elected leader who has emerged victorious from all the elections he contested, either directly or viscerally, in the last thirteen years, including the most recent one where his party managed to get 49.5% of the votes and 317 seats in the parliament, just 13 short of the majority required to change the constitution. Internationally, too, Erdogan is far from being the esoteric ruler of some distant country that the “west” prefers to ignore. He is a member of the coalition that fights against the Islamic State; he has the robust backing of the United States and the European Union which are prepared to go a long way towards accommodating his demands in return for the use of military bases in the case of the former, and a promise to stem the refugee flow in the case of the latter. So it is not all about Erdogan. It is also about the people, at least a substantial majority of those at voting age, who have expressed their support for his party and its policies. And it is about the west which has once again chosen to prioritize interests over values. The options for those who believe, in the words of V, the fictional character of the dystopian political thriller V for Vendetta, that “there is something terribly wrong with this country” are not that many. They can opt for silent obedience, accepting whatever fate befalls them; they can turn to cynicism and repeat George Bernard Shaw’s famous definition of democracy as “a device that ensures we shall be governed no better than we deserve” until they convince themselves; or they can speak up as Tahir Elci always did – for example when he defended the rights of the 35 civilians killed by an air strike in 2011 in Uludere/Roboski, among so many others. It is to his memory that this article is dedicated.